In actual fact this was our second attempt at this particular babydaytrip. The first time was a few weeks ago when I decided to take MJ to the Natural History Museum on my own, but inadvertently went during half term. The Museum was packed and I struggled to get the pushchair through the crowds, had to queue for each lift and couldn’t let MJ get out to toddle around as it was just too busy. So if you’re taking a baby or pre-school children, my tip would be to avoid half term (and weekends if possible) in order to get the huge Museum at its quietest, most manageable and to let little ones get a good look at what’s there. 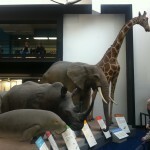 For our second attempt, three of us went to the Natural History Museum on a Sunday afternoon. Given the size of the Museum, we decided to pick just a few areas to visit: the Dinosaur, Mammals, Human Biology, Creepy Crawlies and Earth galleries. 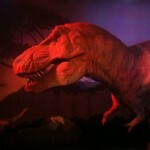 Predictably, the Mammals and Dinosaur galleries were the biggest hit with MJ. He loved practising his recently-acquired animal noises at the tiger, bear, monkeys and other mammals on display and couldn’t tear himself away from the giant animatronic T-Rex model in the Dinosaurs gallery. Elsewhere, it was the adults who were fascinated by the Human Biology gallery with its interactive exhibits and memory test and wowed by the size of the blue whale and other “massive mammals” exhibits. If you have time, the Museum has a huge number of permanent galleries to visit, temporary exhibitions, plus a wildlife garden (which was closed during our visit). We were impressed by the number of opportunities to interact with exhibits, the variety of media used and the fact that there were learning volunteers on hand in some of the galleries to engage with younger visitors. The Natural History Museum’s striking building is worth a visit in itself; once inside there’s so much to see that it’s too much for one trip and you’ll leave promising to make a return visit. Children will love the dinosaur and creepy crawly galleries, as well as the chance to see exotic animals such as koalas, kangaroos and giraffes. 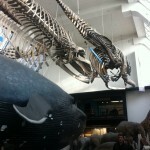 Admission to the Natural History Museum is free. An entrance fee may be payable for temporary exhibitions. The Natural History Museum has a restaurant and several cafés. The licensed restaurant serves hot and cold meals (mains approx. £7-9), including a children’s “Scoffasaurus” menu (approx. £4). High chairs are available. The cafés serve hot and cold drinks, sandwiches, cakes and other snacks. We found that the quietest café was the one located at the entrance to the Darwin Centre in the Orange Zone. All of the cafés have high chairs. There’s a picnic area where you can eat your own lunch. The Museum is pushchair accessible, although you may have to queue for lifts between floors at busy times. Folded pushchairs can be left in the cloakroom free of charge. Baby changing facilities are located throughout the Museum. High chairs are available. Explorer backpacks can be borrowed free of charge for children under 7. 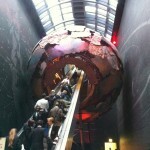 The Natural History Museum is open daily from 10 am to 5.50pm. 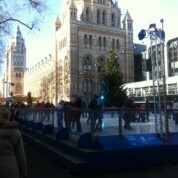 By train: The nearest station is South Kensington on the Piccadilly, District and Circle Lines. No step free access. By bus: 14, 49, 70, 74, 345, 360, 414 and C1.